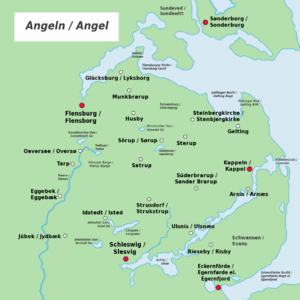 Modern Angeln, (Danish: Angel; Latin: Anglia, which also means in direct translation from Latin: England), is a peninsula in Schleswig-Holstein, Germany. Ancient Angeln may have been somewhat larger than the Angeln of today, but following the ancient sources it included the territory of modern Angeln. Angeln has an importance far beyond its small area, as it seems to have been the original home of the Angles who invaded the southern part of Great Britain, which was named after them, England. And so the name of the major world language, English, seems to have taken its name from this little region. Following the departure of the Angles from Anglia about 350, the region was occupied by Danish settlers not later than the 8th century. Flensburg is the largest Anglian town. View to Flensburg-Jürgensby on the Anglian side of the Flensburg Firth. 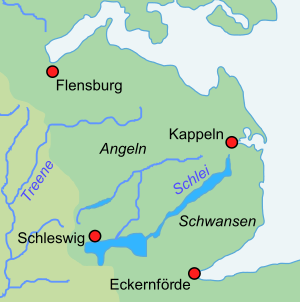 From the 9th to the 11th century, Danish was spoken in Anglia (red), and Slavic dialects were spoken in Wagria (brown). Flensburg Firth with the Red Castle of Mürwik. Mürwik was the place where the Flensburg Government was to find in May 1945. Angeln Facts for Kids. Kiddle Encyclopedia.